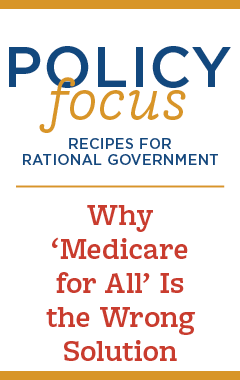 IWF - Should Healthy, Employable Americans Keep Medicaid Forever? Should Healthy, Employable Americans Keep Medicaid Forever? If Medicaid is meant to be a social safety net program available to those in their time of need, is it reasonable to set limits on how long they stay in the program? Federal officials are considering this question as states are looking for new ways to innovate Medicaid to be targeted to those who actually need help and to reduce the costs of the program. Five states (Maine, Arizona, Utah, Wisconsin, and Kansas) have asked the Department of Health and Human Services for a waiver to place a limit on how long Medicaid beneficiaries can receive health benefits. As you may remember, Medicaid is a federal program that provides healthcare for those in poverty. The program was expanded under the Obama Administration as a part of the Affordable Care Act to include healthy, working-age adults with no children (so-called able-bodied recipients). As a result, the program has continued to balloon into the third largest and one of the fastest-growing government programs. It’s overburdened leading to worse access and outcomes for Medicaid recipients. The Medicaid expansion may have also unintentionally contributed to the rise in opioid abuse. Now that the economy is back on its feet and unemployment is at its lowest levels in recorded history, we have a chance to right-size the program. The Trump Administration recently issued guidance that allows states to impose work and community engagement requirements as a condition to receive Medicaid benefits. The waivers vary, but the proposals are generally tied to work requirements. Utah and Arizona both seek a maximum of five years eligibility. In Arizona, the five-year window would only apply when a beneficiary doesn’t meet the work requirement. Utah’s request makes a deliberate link between benefit limits and welfare. “It’s clear that [the administration] view[s] Medicaid not as a health insurance program. They are hopeful to get as many people off the program and off public assistance as possible,” said Jessica Schubel, a senior policy analyst at the Center on Budget and Policy Priorities. While these supporters may mean well, how can they defend allowing able-bodied adults with no children on an over-run public program when the abundance of jobs, rising wages, and individual tax cuts means that these adults have more income to spend on necessities like food and healthcare? Children, pregnant women, and people with disabilities would be exempt from any coverage limits so coverage for those who are truly vulnerable would be protected. Whether lifetime limits will be approved is one issue, but there is nothing unreasonable about efforts to make Medicaid work for those who truly need it.